For weeks I wondered where all the snails disappeared to. During Winter, with the small amounts of rain we had, I sometimes went out into the garden to find snails, and to my surprise, they mostly eluded me despite searches under and around their favourite hiding places. However, one night last week, with warmer temperatures and a good fall of rain, they swarmed across the garden like schoolchildren being let out of class and achieved large amounts of damage. 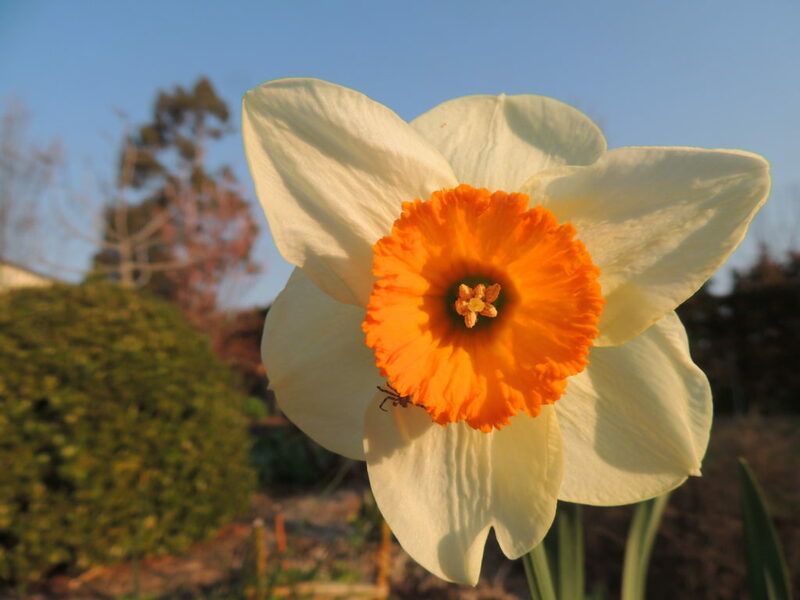 Some of my photos for this week's six, which is celebrating Narcissi, bear testament to the marauding of the snails. I apologise in advance for the lack of identification, and hope that some more knowledgeable plantspersons will be able to assist. One: Narcissus 'Red Rocket', not nearly as red as the picture on the packet, but charming nevertheless, complete with small visitor. 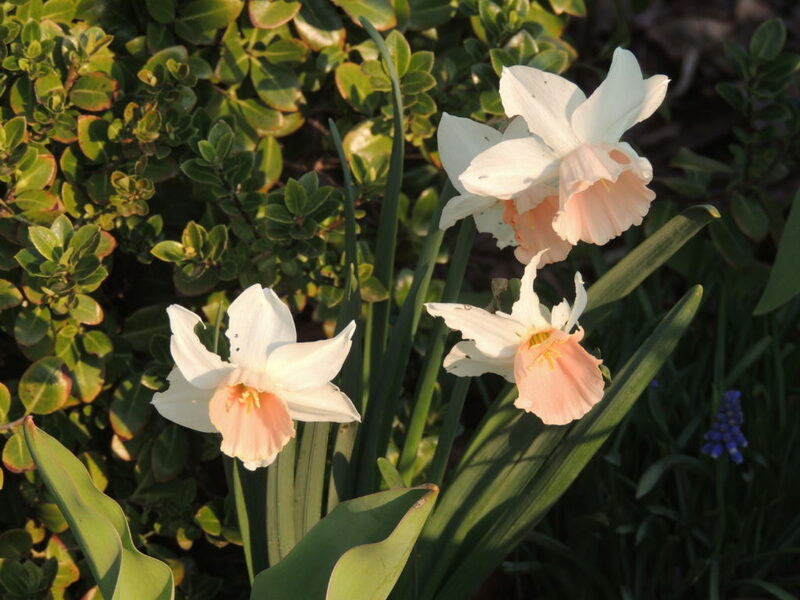 Two: Narcissus 'Ice King'. This becomes surprisingly yellow as it ages, so much so that I have questioned my own identification. Three: I don't know the name of this one, but she could be called 'Weight of the World'. Five: Narcissus No ID. 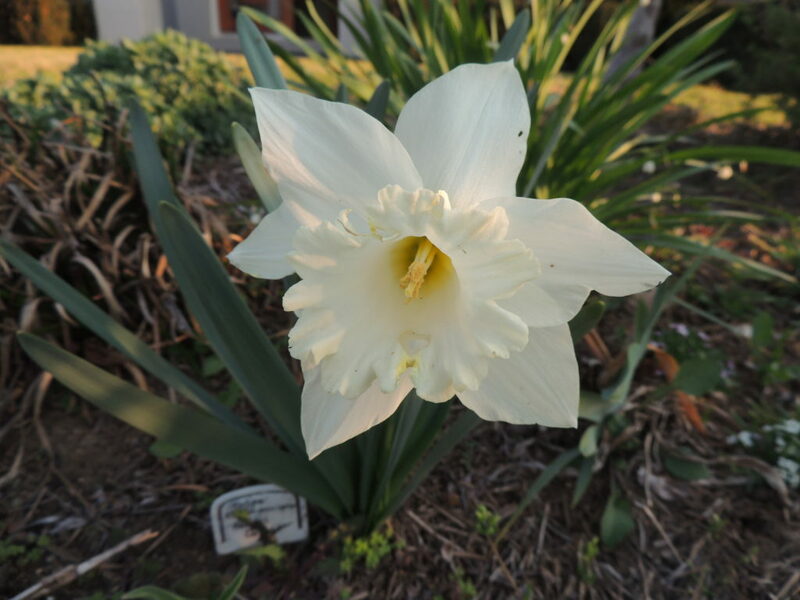 I love the whiteness and simplicity of this narcissus. I’ll make up a name: ‘Blanc et Blanc’! 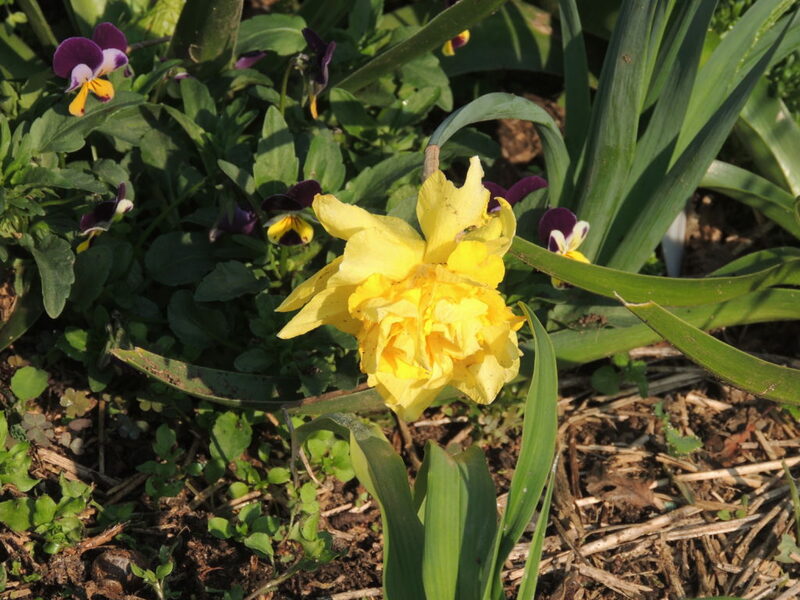 Six: Also Narcissus No ID, with a great deal of damage from the slimy molluscs. That's my six for this week. As always, the venerable host of this meme, the Propagator, has more sixes on his blog. Click here to find out more. Weather today: 3 to 28 degrees C and windy. 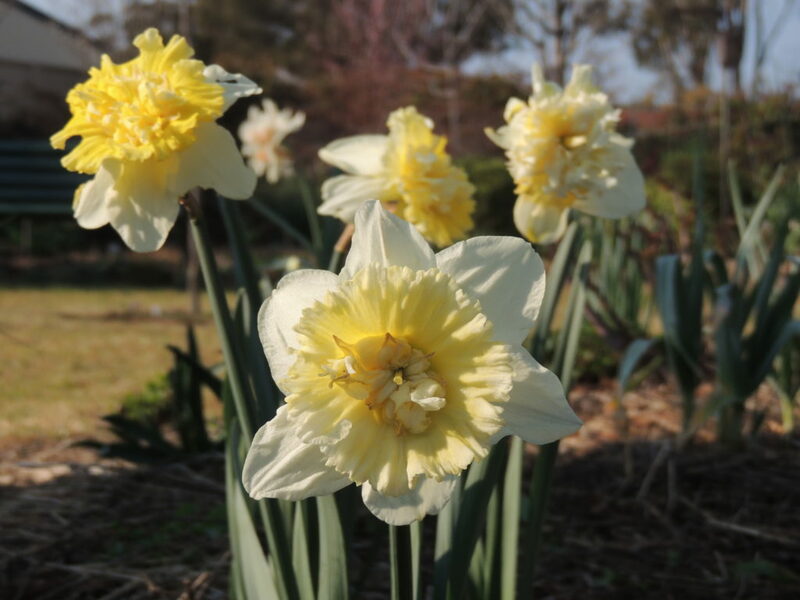 I’ve got an urge for a fried egg looking at your narcissi. Ha ha- I see what you mean! Of course you bought bulbs! As I would if I had access to that website. The wonder of it is that you were able to choose some/a few/lots from such a tempting selection. Sportsman is very bright and cheerful, Fred and sure to be an excellent addition to your collection. I’ll keep a lookout for him in your six when Spring comes to you! Just put my bulb order in, Jane, and it does contain Narcissi! Something to look forward to, Tim! These are smashing. Love Weight of the World w/the pansies. Really nice combo. That first photo is stunning as well. Makes me wish for spring here. Much inspiration for bulb purchases! Thanks, Lora. I think quite a few Sixers are getting inspired to order their Spring bulbs. Poor Weight of the World could barely lift her head off the ground! What do you do, Jude, to try to keep the munching to a minimum? I was truly amazed at the number of snails that appeared in my garden, and they were just the ones I could see! Have you tried the beer traps? I’m going to set some as I’ve been told they work very well. It seems strange to see narcissi in September! One of the features of Six-on-Saturday seeing other seasons. Lovely blooms. It would seem strange to you, and I have the same feeling about seeing NH posts, although seeing new-to-me plants on SoS has encouraged me to try some new things in my garden which is quite fun. Some lovely photo’s there Jane. The Slugs Song have come back with avengece in my garden after a wet few weeks. They’re such a nuisance, Paul, and they love to set up camp in and around succulents! They are charming flowers, aren’t they, and so full of sunshine. Except when they’re white, I suppose. Right. If I do only one thing tomorrow it will be to complete my spring bulbs order. I love ‘Red Rocket’ and the bottom one with the pink trumpet. I must get more narcissi. They are supposed to be poisonous so rabbits and deer do tend to leave them alone. Molluscs too, up to now.. I hope they’re not reading your post! It was only the flowers that they ate, and I think putting some beer traps out might help. I’m going to try that, anyway. Thank you for the Spring greetings, Gill. It really is such a wonderful time in the garden, and I have to do a little tour at least twice a day to see what’s changing. Lovely, especially the soft pinkish tinge to the last one. I like the Blanc et Blanc too. You could try some in a pot on your balcony, Vicki. They’d look very cheerful there. ‘I wandered lonely as a cloud …’ Reminds me of Wordsworth. I’m blaming Mr Wordsworth for my desire to instantly have a host! Not sure I’d like a raccoon- I have a sneaking suspicion they’d cause a few problems of their own! We do have quite large lizards- bearded dragons, and if we’re lucky, blue tongue lizards, so hopefully they’ll help out a bit. Darn those snails, they must have been waiting for the right moment to attack en masse! Your blooms are still beautiful though. It was really strange, the way they all seemed to appear from nowhere. I didn’t think that snails would hibernate, but perhaps that’s what they were doing-and breeding as well! Lovely flowers. 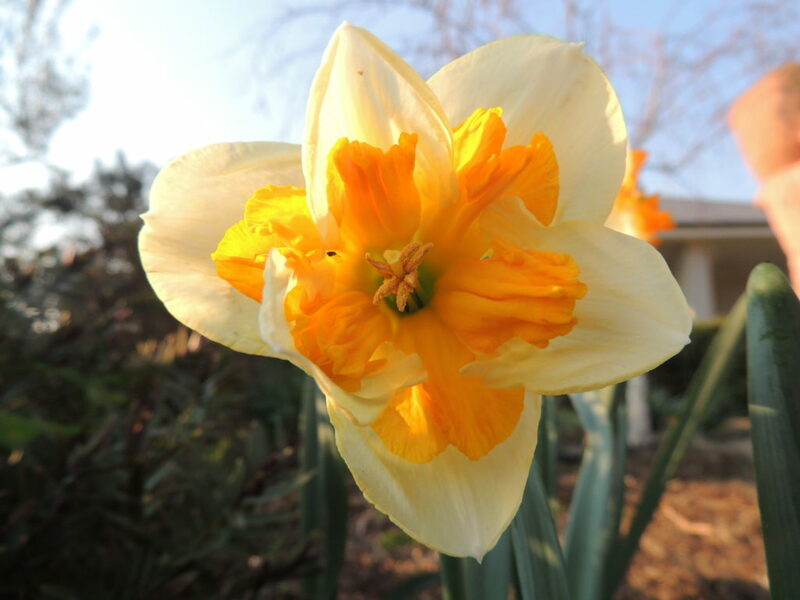 I’ve just planted some more narcissi so your photos are a great reminder of what’s to come next spring. Something to look forward during the cold days of winter! I must get some more interesting daffs this year I just have the bog standard yellow ones. I feel a bulb order coming on…. Nothing wrong with bog standard yellow ones either. Like most plants, once you really start looking, there’s a wide choice available. I’ve been discovering this on posts about dahlias, for instance. Beautiful pictures. I ordered bulbs a couple of weeks ago but having seen yours I think I might need to order some different ones! 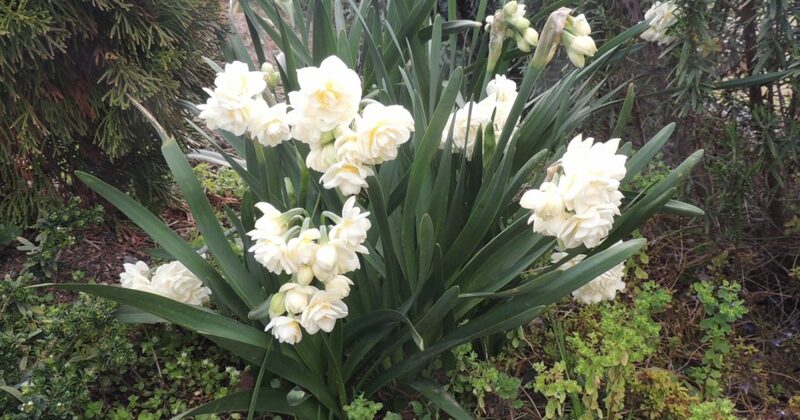 There are so many beautiful narcissi it’s difficult to make a choice. It’s so lovely to see all your narcissus, Jane! I love your pink-cupped daffodil, despite the rascally snails! And the lovely little doubles at the top of the post – quite pretty! Because of the low-chill winters, the paperwhite types work best for me here, but I can’t resist trying some of the others – definitely with mixed results! Hi Amy,glad you enjoyed the photos. The Narcissi at the top of the page are Erlicheer, and if paper whites do well in your garden, I think those might too. They’ve all brought such a lot of pleasure in these early spring days that I think I’ll be buying a lot more, come Autumn. Cursed snails! I have a similar problem, so much so that I’ve started planting only resistant plants and avoiding things they munch. Thank you for those two IDs, Eliza. Looking at photos, they could both be correct. The wretched molluscs only seemed interested in the flowers and not the leaves and they certainly made a mess. I’ve done a fair bit of stomping in the garden! Thank you! I think a few NH gardeners have been prompted to put in their Autumn orders! How lovely (if a bit weird for this NH dweller!) to see such beauties flowering, Jane – are they all scented, too? I have every sympathy about the snails having spent the entire year battling with them here, they are so destructive, Nothing for it but all-out war! PS I’ve relented and written a quick update this week on my ‘old’ blogsite if you’d like to see what we’ve been up to in sunny Spain. Happy equinox! Hi Lis, I can’t tell you if they’re scented as I have no sense of smell which is a sad thing for a gardener! What do you do about the snails? Hobnailed boots? Beer traps? Or do you have another remedy. Will look at your update. Oh, thanks, Anna. We haven’t had any rain since then so the snails haven’t been so evident. It’s such a pleasure to see the garden waking up…something new to see every day. Jane, it is funny how you are in spring and we are getting ready to enter Fall. It will be many months before we see spring flowers. Have to go through the darn winter first. Great post and AWESOME photos as always! It’s always a strange thing to contemplate, the difference in the hemispheres, Lonnie. Thanks for your comment, glad you liked the photos. You’d get plenty of rain where you are-something we don’t see nearly enough of, so rotting bulbs tends not to be a problem.